For some time now I have VMware View running and with the Windows 7 BETA being available I tried to add Windows 7 to VMware View. Since I already created a VM with Windows 7 on my laptop in Vmware Workstation, I imported that VM in Virtual Center and saved some work. After the conversion/import of the VM was completed I tried to add it to VMware View with the VMware View administrator. Unfortunately Windows 7 was not recognized as an Client Operating System and therefore could not be added. So I asked myself how does VMware View know that it isn’t (or thinks that isn’t) an Client OS? 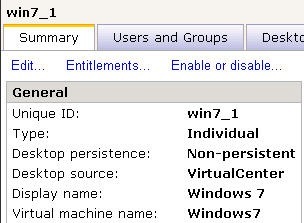 VMware View communicates with Virtual Center so properties of a VM are communicated from Virtual Center to VMware View. So the solution is in making VMware View think it deals with a supported OS! After I changed the OS type and version I was able to add the VM to VMware View. Great Tip! 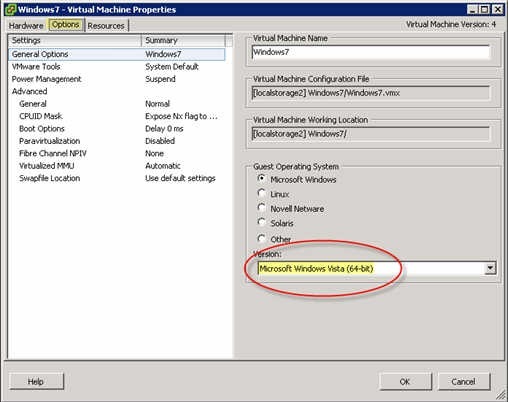 Were you able to install the View Agent into the WIN7 VM? Do you happen to have the steps available you used to get the VMWare View Agent 3.1 installed on the actual Windows 7 virtual machine?